Keiko Knowles with her son, Takemi, and husband, Martin, on her mother’s front porch. 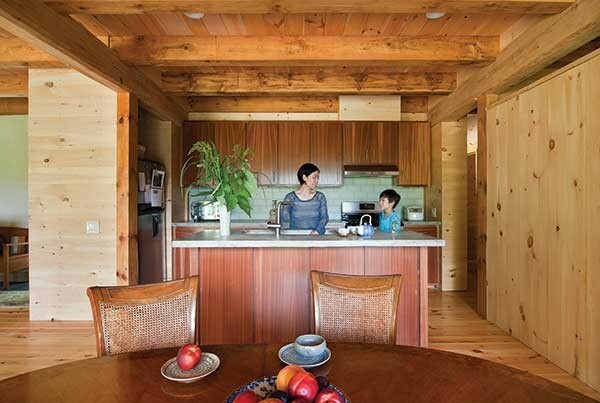 When Keiko Knowles's mother, a widow from Tokyo who prefers to remain nameless, decided to buy the lot adjacent to her daughter's family home in Bearsville, "Obaasan" (Japanese for "grandmother") knew that because of building restrictions attached to the property, her future home would have to be small. She did not anticipate, however, that soon she would risk most of her savings to become a "patron of the arts" in commissioning a 1,000-square-foot modern straw-bale architectural gem that "really makes no investment sense at all." "I want to leave something behind for the world, and I feel that this house is actually really important in some way, but we'll figure all of that out later," says Obaasan. "I could never have gotten a permit to build a McMansion here, and that's the opposite of my taste, but for what this ended up costing, I could have had something like that." Obaasan bought the property—four pitched acres with a view of Yankeetown Pond mirroring Acorn Hill—in 2010 for $100,000. Located on a ridge within the Ashokan Reservoir watershed, the lot had belonged to a well-known developer who bought it as an investment that foundered. Due to difficulties obtaining permits plus an overly optimistic flipper's price tag, it sat on the market for several years noted for weak housing demand. The tract was once part of a Jewish boys' summer camp attended by family comedy legends the Marx Brothers. In the '70s, it was a thriving pot farm until the owner got busted. Preparing tea in the kitchen; custom-built bookshelves in the library. When Obaasan bought it—at the developer's land-purchase cost—the two rundown cabins that had stood on the property had recently been torn down. The "buildable footprint" they justified was enhanced by a new septic system for which the City of New York covered half the cost—had it been owned by a full-time resident, it would have been 100 percent, due to a need to safeguard the water supply. The developer had also cleared trees obscuring the view, put in a new driveway, and towed away abandoned cars. He ate the expenses associated with those improvements, and was gracious and gentlemanly about the loss. Naturally, Obaasan wanted to make the most of the view. 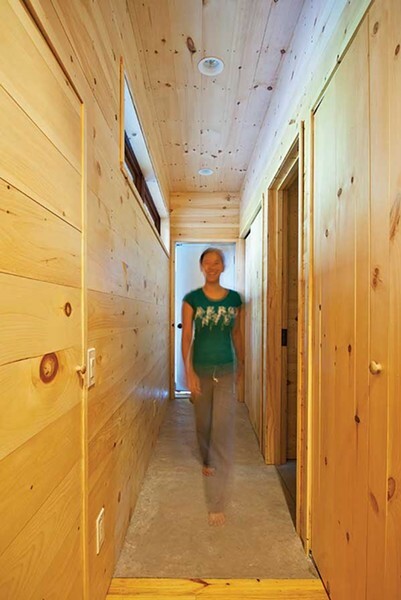 She also desired that her new home be as thermally efficient and environmentally friendly as possible. At 76, Obaasan still drives and hikes—her late husband fly-fished and kept hunting dogs. She has a group of Japanese ladies with whom she socializes, and she's fond of watching cooking shows on television and then preparing a special treat for family and friends. But it was the opportunity to live beside her daughter's family that compelled her to relocate from a large condo in Port Ewen and embark on this adventure. "When my children were growing up, their grandmother had a lovely traditional home in western Japan, and it was such a great experience for everyone to spend time together there," says Obaasan. "This was a big part of my intention. But because I have two other daughters who live elsewhere, Keiko and I had to make sure that everyone in the family supported this idea. I think perhaps they wish it was a little bit bigger, because although we can convert the library/television den into a guest room, it's really just a one-bedroom, one-bath house, with a two-car garage and lots of clever storage." Keiko, an artist and permaculture expert, is married to Martin Knowles, a therapist originally from England; they have a 15-year-old daughter, Suika, and an eight-year-old son, Takemi. 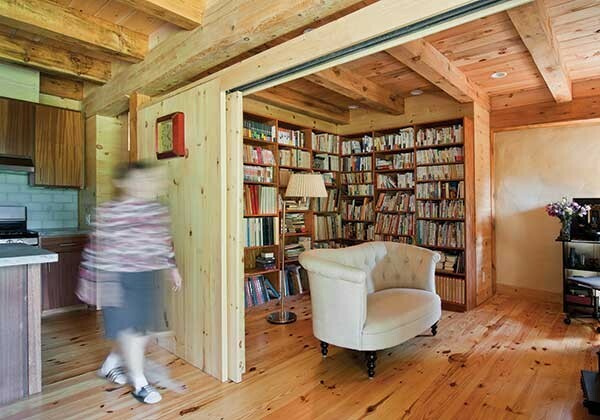 A few years ago, the family decided to expand the '40's bungalow they purchased in 2004. That's how they met William Johnson, a builder based in New Paltz. Out of three bids solicited, Johnson's proposal for the addition was the most innovative. While still an anomaly even among green-building sophisticates, straw-bale construction is admired and appreciated as one of the oldest and best building methods. A well-made straw-bale timber-frame home built today might easily last for several hundred years. It's warm and quiet, with a resonant solidity. Suika Knowles in the narrow corridor connecting the bedroom and bathroom to the rest of the house. 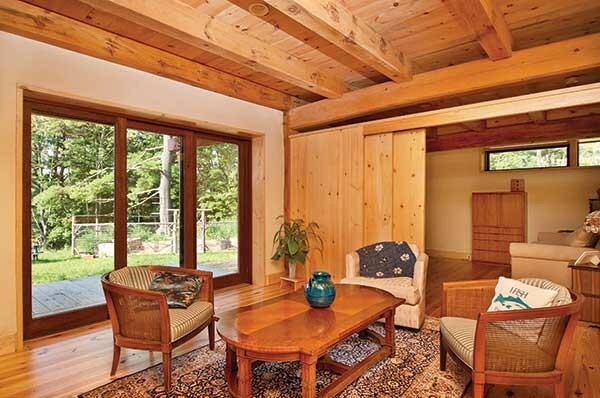 In Obaasan's cottage, Johnson amplifies that "built-to-last" vibe with quality woodwork such as pocket doors and custom-built rot-resistant mahogany windows. The countertops in the bathroom and island kitchen, which faces the 280-square-foot porch, were made on the premises from cast concrete. The premium Toto toilet, with water jets, is in a separate enclosure from the updated Japanese style bath, comprised of a spacious stall shower opposite a soaking tub. They broke ground for construction in September 2011. The project was put on a six-month hiatus while Obaasan sold off some investments that enabled her to continue to build her dream home without having to borrow money. In theory, it might have been difficult to obtain a construction loan, mostly because it would be all but impossible to establish comparables. Final cost was about $275 per square foot. 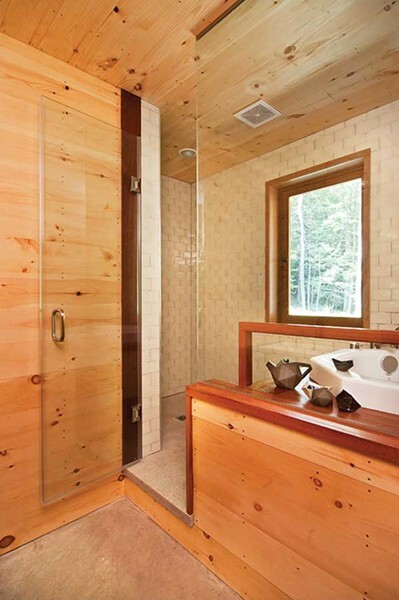 The bathroom features a Japanese-style deep soaking tub. Ceramics by Peter Barrett. "Building this house was a poignant and spiritual experience," says Johnson. "I moved to the region from Georgia 25 years ago to build a Japanese-style gazebo on Yankeetown Pond. I can see how I've grown in my craft. I made a friend back then, an old man named Dave Van de Bogart, who belonged to the Wittenberg Sportsmen's Club and used to tell us "back-then" stories. One day he gave me a giant antique timber-framing chisel called a slick. I used that chisel on this house." Obaasan says Johnson's reflective, meticulous professionalism gave her the confidence to splurge on highly considered aesthetic simplicity. Her late husband did many things with craftsmanlike precision; he made his own bamboo fly-fishing rods. "He was shokunin katagi, the true craftsman soul. Will is that too," says Obaasan. Obaasan finally moved in this July and "couldn't be happier" with the way her home looks and feels. She doesn't feel her "hodgepodge" furniture quite does the design justice, and the living roof, vegetable garden, and permaculture landscaping remain on the to-do list. But she's having a wonderful time living next to the Knowles family and looks forward to soon hosting her other two daughters as houseguests. "My grandchildren come over for miso soup, rice with egg," says Obaasan. "But even for a snack, they must eat at the table; I don't care if they use silverware or chopsticks. But no shoes in the house!" "It is really a miracle that this house happened. My mother took a huge gamble with this, but she will probably be able to live here independently for the rest of her life, and she's in excellent health and we have every reason to anticipate that could be quite a long time," says Knowles. "It's been a pleasure to be her collaborator in creating this, together with Will. During construction, I was on the site almost every day. But it's so satisfying! With all the details in place, it's really breathtaking. My mother is very private, very modest, but we want to share this place with the world in some way, so we'll see what happens." The wooden chairs and table were brought from Japan. The pillow on the chair is made from Obaasan’s late husband’s favorite sweatshirt.